Cassandra Eberhardt a former youth member of Holy Trinity, volunteered at Aliñambi Orphanage one summer. When Cassandra returned and presented her experiences to the congregation, we adopted the orpahange as one of our outreach projects. Aliñambi is located a half hour bus ride south of Quito, Ecuador. It was originally started as a home for children who either do not have parents or cannot live with their parents for whatever reason (e.g. child neglect). The Foundation also runs a school (Pre-Kindergarten through 7th grade) and a medical center which serve the surrounding communities. Holy Trinity supports the Gleaners Foodbank of Belleville, and the Quinte West Care and Share Trenton.the last Sunday of each month food is collected and delivered to the food bank, to date 700 pounds have been delivered. Holy Trinity Knitting group started knitting these vests and the project has grown to include several local churches and other knitting groups. To date over 1100 Vests have been delivered. The vests are sent to CLWR for distribution. The Open Door Cafe is run out of Eastminister United Church every Wednesday for lunch. Holy Trinity first Sunday of the month donates all loose offering to the Open Door Cafe, along with other special activities to support this needed East End Outreach. Holy Trinity Knitting group started knitting Boomer Caps in support of the Boomers Legacy. 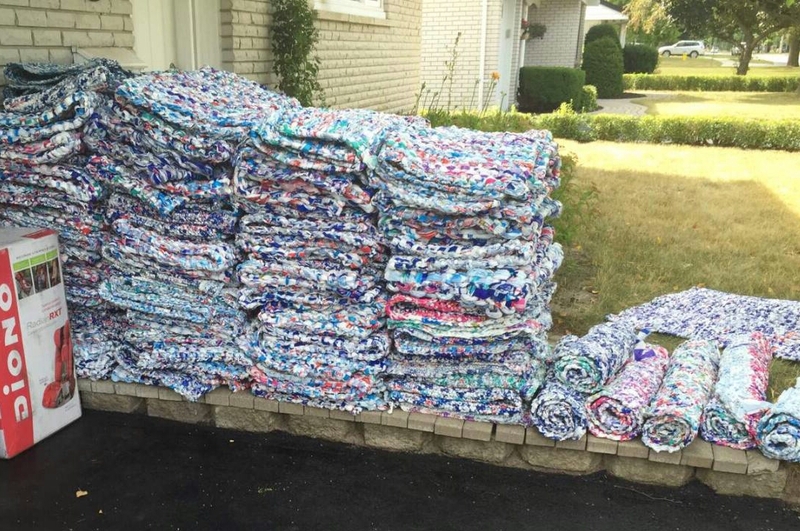 Holy Trinity has also been crocheting and weaving milk bag mats for the past 5 years. These mats are sent overseas to be used as sleeping mats to protect from wetness, bugs and to offer warmth while sleeping. In some instances the mats have been used to wipe feet before entering a home and even as wall hangings at the Zataari Refugee Camp to add a splash of colour to an otherwise bland looking tent! To date, we have sent a little over 200 of these mats to various places in the world.